Well, it is Spring, after all: the time for rebirths and all that jazz. And the latest release from Brisbane's Green Beacon is just that. 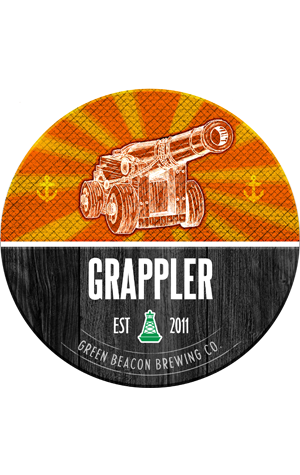 Having recently decided to reinvent their Whaler as a blood orange IPA (it was previously a zesty golden ale), they've now decided to rework their Grappler. The beer was originally an India Pale Lager (a lager hopped to the level you'd expect of an IPA) and, if memory serves correctly, was one of the standout beers on our first visit to the brewery a couple of Brewsvegae (is that the plural of Brewsvegas?) ago. The brewers felt it could be better still so, while they've stuck with the concept of a hop forward beer, we're told Grappler 2.0 features a leaner body and drier finish "to increase session-ability". There's a touch of the Old World in the form of imported pilsner malts and a touch of the new in the shape of New Zealand hops derived from the Czech hop Saaz that gives Bohemian pilsners much of their character. The brewers say to expect "upfront hop flavours of citrus zest, fresh cut grass, gooseberry and a hint of passionfruit" as well as "classic grainy malt characters" and a "subtle bitterness".